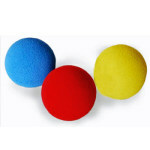 Make little balls appear, disappear and travel between three huge cups! Really surprise them with a great ending! 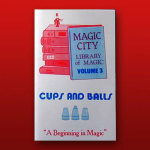 The Cups and Balls is one of the most popular tricks in magic. Easy to learn, but there are limitless routines and variations. The basic routine is simple. 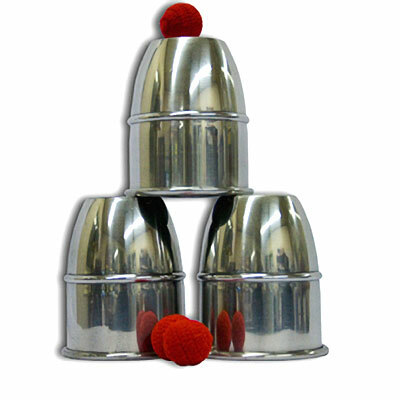 Three balls move invisibly between three cups, whether the cups are side by side or on top of each other. And this set lets you end the routine with a SURPRISE! 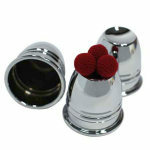 The large size cups not only work effortlessly, they will also hold just about any load you can think of! Even an orange, a lemon or an egg will fit- what a surprise ending! The finish on these cups is gorgeous as well. 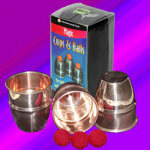 The mirror polish shows off the professional silver color finish to these specially balanced cups. 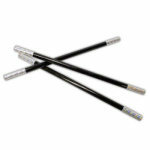 Yes, they are aluminum, to make them lighter weight and so easy to handle! WARNING: CHOKING HAZARD. Do not put the balls in your mouth. Not suitable for children under 5 years of age. Cups are 4" high, 3" diameter. 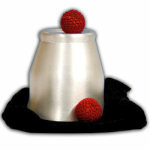 Made of aluminum with polished silvery color finish. 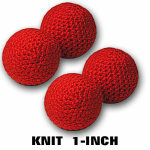 Balls are made with a knit covering. 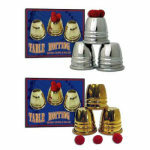 Q: This "JUMBO Aluminum Cups and Balls" set has a video that at exactly 1:00 minutes in, shows a move only possible with a "chop" cup. Is this a chop cup combo set? If not, is such a set available in a Jumbo size? 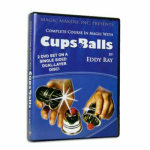 A: Actually, that move is a regular Cups and Balls move! This set of cups is not gimmicked in any way. Nice look and feel to these cups and balls. Worked a basic routine for my wife after about an hour of practice and she was impressed. You can't go wrong here!